The presence of clinical Acinetobacter baumannii (A. baumannii) isolates with differing antibiotic resistance phenotypes in the same patient causes difficulties and confusion in treatment. This phenomenon may be caused by reasons such as cross-infection from neighboring patients that switches to different A. baumannii strain, natural mutation of A. baumannii, inducing of different antibiotic resistance genes expression or acquisition of genes conferring resistance from another source. To elucidate this question, clinical A. baumannii strains, isolated from the same individual patients, showed antibiotic resistance phenotypes switching during the same hospitalization period, were attentively collected for further analysis. Molecular approaches for phylogenetic analysis, including pulsed field gel electrophoresis, multilocus sequence typing, and short tandem repeat analysis, were employed for the chronological studies. Our results showed that antibiotic resistance phenotype switching could have occurred as a result through both cross-infection and natural mutation roots. Our results also suggest that rapid phenotype switching between paired isolates could occur during one single course of antibiotic treatment. Though cross infection caused antibiotic resistance phenotype switching does occur, natural mutation of A. baumannii isolates is particularly cautious for antibiotic treatment. Acinetobacter baumannii (A. baumannii ) was identified from the environment in the early twentieth century, and has been isolated worldwide. The rapid spread of multidrug-resistant A. baumannii (MDRAB) in clinical settings has made choosing an appropriate antibiotic to treat these infections difficult for clinicians. A. baumannii within genetically uniform populations exhibit significant phenotypic variability . For example, antibiotic susceptible clinical A. baumannii isolates can develop antibiotic resistant phenotypes, in a process called phenotype switching. Such phenotype switching can be perplexing for clinicians, in both interpreting microbiological results and choosing effective antibiotics. Shanley et al. showed that Acinetobacter calcoaceticus can naturally uptake, incorporate, and stably maintain DNA in vitro. Only a few reports have mentioned the rapid adaptation of A. baumannii isolates in a hospital environment [3, 4]. Determining whether the multiple resistance phenotype switching is due to cross-infection from neighboring patients or from natural mutation of the same A. baumannii isolate is important because of the different strategies needed to resolve the clinical issues. Here we report the rapid change of resistance phenotype of clinical A. baumannii isolates from individual patients during the same admission at a single medical institution in Taiwan. We designed a chronological study to collect pairs of phenotypically-identified A. baumannii isolates from individual patients during the same hospitalization period at Changhua Christian Hospital (CCH). Pool of samples for further analysis was collected from January 1 1998 to December 31 2008. Among those samples, there were three pairs of clinical A. baumannii isolates from CCH that met the inclusion criteria: Pair 1 (isolates 29-4 and 29-43, numbered according to their position in the CCH Bacterial Bank), Pair 2 (isolates 10-18 and 10-10), and Pair 3 (isolates 14-91 and 14-81). Phynotypic method to identify those A. baumannii isolates is using a Vitek-2 System (BioMerieux, Marcy l'Etoile, France). And, the isolates were identified according to 16S ribosomal RNA region at the molecular level, as previously described . Genomic DNA was isolated from three colonies from an overnight culture grown on blood agar plates (bioMérieux, Den Bosch, The Netherlands) using a Bacterial Genomic DNA Isolation Kit III according to the manufacturer’s instructions (Roche, Mannheim, Germany). The ribotype pattern was interpreted to identify the group to which each strain belonged, as previously described . The primer pair REP1R-I (5-IIIICGICGICATCIGGC-3) and REP2-I (5-ICGICTTATCIGGCCTAC-3)  was used to amplify putative REP-like elements from the bacterial DNA. We followed a standard protocol for pulsed-field gel electrophoresis (PFGE) analysis of the A. baumannii isolates. In brief, A. baumannii were plated on blood agar and incubated in a 5% CO2 atmosphere at 35°C for 16–24 h. Plug slices were digested with 20 U of Sgr AI. 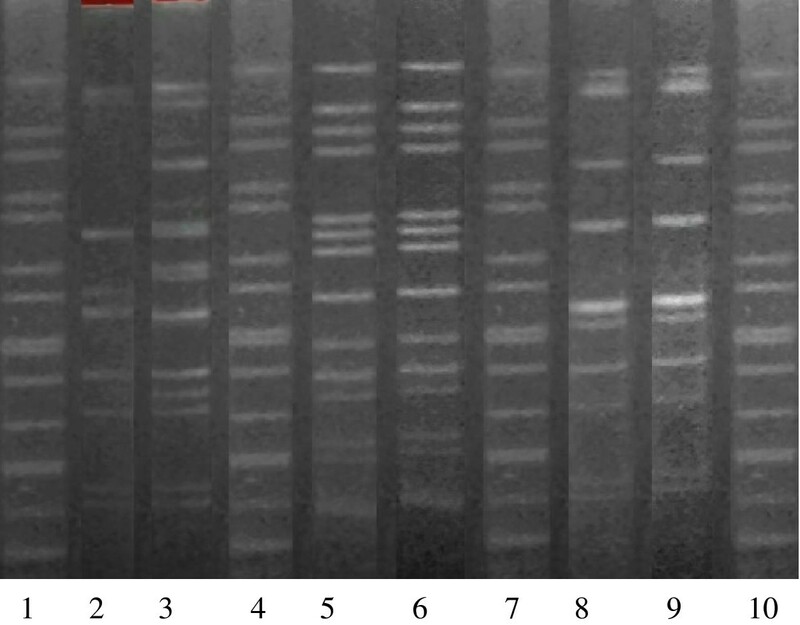 The DNA fragments were then separated in 1% Seakem Gold agarose gels (FMC BioProducts) at 14°C using a Bio-Rad CHEF DRIII PFGE system (Bio-Rad Laboratories, Hercules, CA, USA). Gels were run in 0.5× Tris-borate-EDTA (TBE; pH 8) at a 120° fixed angle and a fixed voltage (6 V/cm), with pulse intervals from 4–40 s for 20 h. Following staining and imaging, the chromosomal DNA restriction patterns produced by PFGE were interpreted using Tenover’s categorization . Multilocus sequence typing (MLST) was performed according to the method of Bartual et al. . In brief, housekeeping genes for MLST were selected based on their sequence availability in GenBank, on prior studies of the phylogenetic relationships for the genus Acinetobacter, and on their use in MLST schemes for other bacterial species [1, 10–12]. PCR primers were chosen from previous studies or were newly designed for amplification of the seven selected genes: citrate synthase (gltA), DNA gyrase subunit B (gyrB), glucose dehydrogenase B (gdhB), homologous recombination factor (recA), 60 kDa chaperonin (cpn60), glucose-6-phosphate isomerase (gpi), RNA polymerase 70 factor (rpoD). All PCR amplifications were performed in a MasterCycler gradient instrument (Eppendorf, Hamburg, Germany). Sequencing of internal fragments (~450 bp in size) of the selected housekeeping genes was performed in an ABI Prism 377 sequencer using the ABI Prism BigDye terminator cycle sequencing ready reaction kit v. 2 (Applied Biosystems, Foster City, CA, USA) according to the manufacturer’s recommendations. We collected clinical and microbiological profiles focusing on the three pairs of A. baumannii isolates from patients during an individual hospitalization. All three patients stayed at our institute for at least two weeks, and all of them received antibiotics following identification of the A. baumannii isolates (Table 1). The antibiotic susceptibility of clinical A. baumannii isolates are listed in Table 2. Four PFGE fingerprint patterns were detected in the three pairs of A. baumannii isolates in Figure 1. Furthermore, there appears to be a clear link of cross-infection between the PFGE types and the clinical data available for the isolates. Interpretation of the MLST data revealed that more than half of the MLST allelic profiles from the three pairs of A. baumannii isolates differed from those already in A. baumannii MLST databases (http://pubmlst.org/abaumannii/). Comparison of the sequence types (ST) of the three paired A. baumannii isolates showed similarity between the 29-4 and 29-43 A. baumannii isolates, especially in the allelic profiles of gltA, gdhB, recA, and rpoD (Tables 3, 4). However, there was a difference between the 14-91 and 14-81 paired isolates, especially in the allelic profiles of recA, cpn60, and rpoD (Tables 3, 4). These results indicated that isolates 29-4 and 29-43 are the same isolate, and that both paired 14-91 and 14-81 isolates and paired 10-18 and 10-10 isoaltes are different isolates (Tables 3, 4). The fingerprint patterns of the STRs were quite varied (Tables 3, 4). It is particularly interesting that rapid phenotype switching between the paired isolates (29-4 and 29-43) could occur during one course of antibiotic treatment. Notes: The susceptibility tests were performed using the Vitek-2 GN card (Biomerieux, Marcy l'Etoile, France). The results were interpreted using the CLSI breakpoints (Clinical and Laboratory Standards Institute Performance Standards for Antimicrobial Susceptibility testing; Twenty-First Information Supplement. CLSI document M100-S21, CLSI, Wayne, PA; 2011). AN: amikacin; SAM: ampicillin-sulbactam; CTZ: ceftazidime; LVF: levofloxacin; IMP: imipenem-cilastatin; PIP-TAZ: piperacillin-tazobactam; CRO: ceftriaxone; CFP:cefepime; MEP: meropenem; colistin and tigecycline and polymyxin B were not provided by Vitek-2 System. PFGE fingerprints of three pairs of clinical A. baumannii isolates following digestion with the Sgr AI restriction enzyme. Sequences of amplified genes were compared with sequences from the A. baumannii MLST website (http://pubmlst.org/abaumannii/). † the given name of the genotype is defined as A. baumannii + number (Ab + number). ‡ the given name of the genotype is defined as Acinetobacter isolate + number (a + number). The is the first report of phenotype switching of antibiotic resistance in clinical A. baumannii isolates in individual patients during the same hospitalization in Taiwan. While A. baumannii has been reported previously in Taiwan, and prolonged administration of broad-spectrum antibiotics will induce the development of antibiotic resistance in clinical A. baumannii isolates, little is known about the current clinical situation. It was demonstrated that a important evolutionary change of a single genotype was fundamental to the continuous rise observed in the number of A. baumannii infections . The current study suggests that natural transformation and mutation of genotypes occurred in clinical A. baumannii isolates 29-43 and 29-4 on the basis of PFGE. We used three methods to determine the genetic similarity of the paired A. baumannii isolates: PFGE, MLST, and STR. Snelling et al. described a PCR assay using repetitive extragenic palindromic sequences to type A. calcoaceticus and A. baumannii strains , while Alcala et al. characterized a meningococcal epidemic wave using a MLST method , similar to that used in our study. The congruence between the MLST, PFGE, and STR data suggests that the findings of the current study are sound; however, further experiments are required to prove the relationships among the paired isolates. In this study, we discovered natural mutation and rapid change of antibiotic resistance phenotype of clinical A. baumannii isolates from an individual patient. This is alarming as this particular clone seems to be able to effectively fill niches that were essentially uninhabited by A. baumannii in the past. Even in a relatively closed environment, the isolates of identical PFGE fingerprint patterns showed a variety of MLST patterns. Apparently, the MLST patterns of paired isolates 29-4 and 29-43 are capable of withstanding background mutation. It is possible that the mutation rate of this particular isolate may contribute to its success in coping with different environments. This study provides novel insight into the clinical problem of whether different A. baumannii isolates from the same patient are due to cross-infection from neighboring patients or from natural mutation. This is important for clinicians because the treatments for the two causes are different. The approach for the first phenomenon is to enhance contact precautions in the clinical practice, whereas the second is the stepwise prescription of different antibiotics. Authors gratefully acknowledge the help of Dr. Chien-Shun Chiou at Center for Disease Control, Taiwan for invaluable assistance with the development of the array-based MLST system. Authors also thank Hsusan-Pei Lin, and Chialin Chang for technical assistance. CHC and CCH designed and performed this study. CCH analyzed the data regarding the infectious diseases and wrote the manuscript. Both authors read and approved the final manuscript.